The United kit for the 1991 Scottish Cup Final was more or less the same Asics designed kit used for the 1989/90 & 1990/91 seasons, with a diagonal pattern and shirt manufacturer’s logo throughout the top, enhanced with an occasional horizontal dual stripe. the shirt had a black V-neck collar with a white and tangerine line included and matching cuffs, black and white triangular panels on both shoulders. 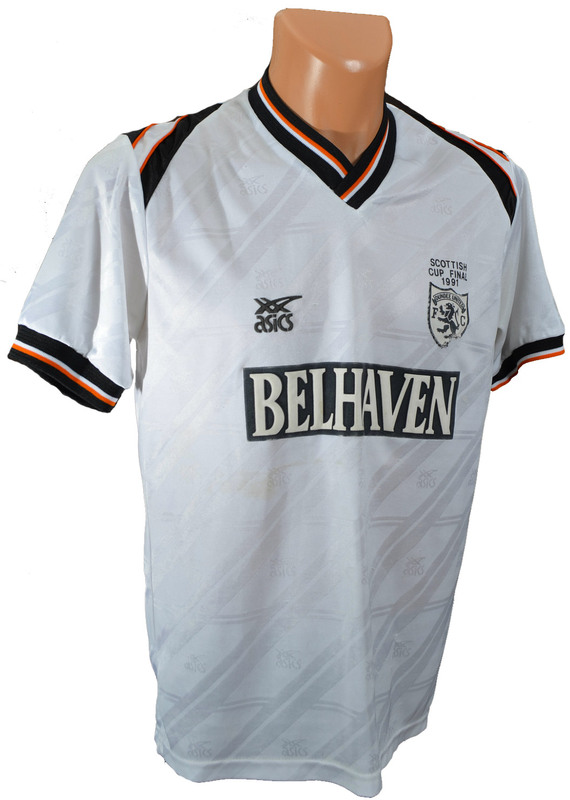 The white and black Belhaven logo remained, as did the Club's lion rampant crest, the only difference from that seasons usual kit was the additional text of "Scottish Cup Final 1991" printed above the badge. In their sixth Scottish Cup Final, United met Motherwell at Hampden Park, and wore the Away kit for the first, and so far only time, in any major Final.